If you don't want to move to a missile silo in upstate New York, perhaps we can interest you in a giant, glass-enclosed skyscraper whose upper units dangle in midair? 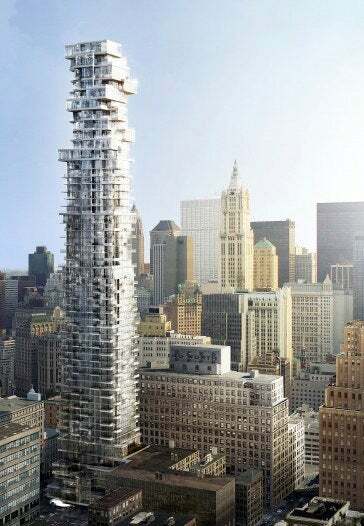 Today the architecture firm Herzog & de Meuron (who recently designed the "bird's nest" Olympic stadium in Beijing) revealed their plans for a 57-story building of irregularly-stacked flats at 56 Leonard St. in Manhattan's Tribeca neighborhood. Each flat will have a slightly different floorplan, and will stick out of the building at an angle, giving it what real estate blog Curbed called a "Jenga look." Plus, the play of light through the glass walls will make the building seem to rotate and shimmer in the sun. You know you want to take a peek inside, and see the pools and libraries of the penthouse units. But first, let's look at what you'll see at street level. There's this bizarre Music Experience Project flashback art by Anish Kapoor wedged between the first story and the sidewalk. I love how it looks like some kind of metal extrusion, exactly the sort of thing you'd expect a building made of nano to squeeze out every once in a while. Now let's float upward to the penthouses. Here's a good look at where some folks willing to lay out $15 million or more will be living when the building is finished in 2010. You can see how each flat juts out, so that it literally seems to hover alarmingly above nothing but air. Inside our lovely dangling flats, you'll get a library. One of the things I love about Herzog & de Meuron's work in residential areas is that they always include a cool area for books. Here's an example of where the library is in another of their forthcoming buildings in New York, 40 Bond Street. Of course, after all that reading, you'll want to take a dip in the pool. Outside the pool area is a balcony that is cantilevered over the city, so when you look down you'll see nothing but air.